Now and then, the latest version of Opera will ship with a different search engine provider for the address bar or speed dial search - since Opera is free since version 5 (or version 8.5, if you count the complete removal of ads for unregistered users), the company has to generate revenues otherwise, and this is done by reaching agreements with search providers, among other avenues. 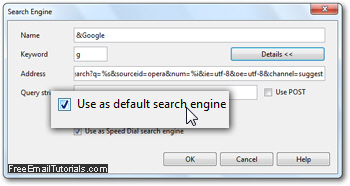 The next tutorial will show you how to change the default speed dial search engine; this tutorial explains how to change your default search engine for the address bar. You will see a listing of all the search engines built-into the Opera web browser (Google, Bing, Amazon.com, eBay.com, Ask.com, Yahoo!, and Wikipedia), plus any custom search engine you added yourself from a search box on a website. ...And this is how easily you can customize your search settings in Opera and change your default search engine options in just a few clicks! Tip: note that whatever default search engine you have customized for your address bar (or speed dial search box), you can always search with another provider by using its "letter" or keyword, which is "g" for Google, "b" for Bing, etc.